reproduction: 20 to 100 eggs laid in the early spring. Mother pythons won’t eat for the 55 to 75 days it takes their eggs to hatch. did you know? 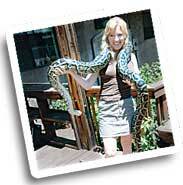 The female python is the only snake that can raise its own body temperature. While keeping their eggs warm mothers will “tremble” their muscles to increase the temperature around the eggs. 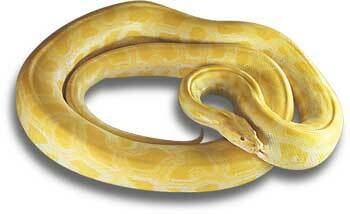 Lola is a Burmese Python without the "albinism" charaterized by bright yellow color. At over 14' in length she's the largest animal in Linda's collection.